I have an addiction: Children's Bibles. It's not that I don't think having just one is sufficient, but I find that different versions excel in different areas. I find myself really enjoying being able to tap into those different strengths, depending on which part of the Bible we are studying. Often times I will read the same story from 2 or 3 different versions to help present the most well-rounded and complete picture. I find that pairing a Children's Storybook Bible with a reading of the actual text in my own Bible helps Matthew develop a better understanding. Though he cannot read yet, my son can narrate what is happening by using the images to trigger memories of what he's heard. I love to see him “read” his Bible. Staring at the shelf in the bookstore can be overwhelming. There are so many choices! 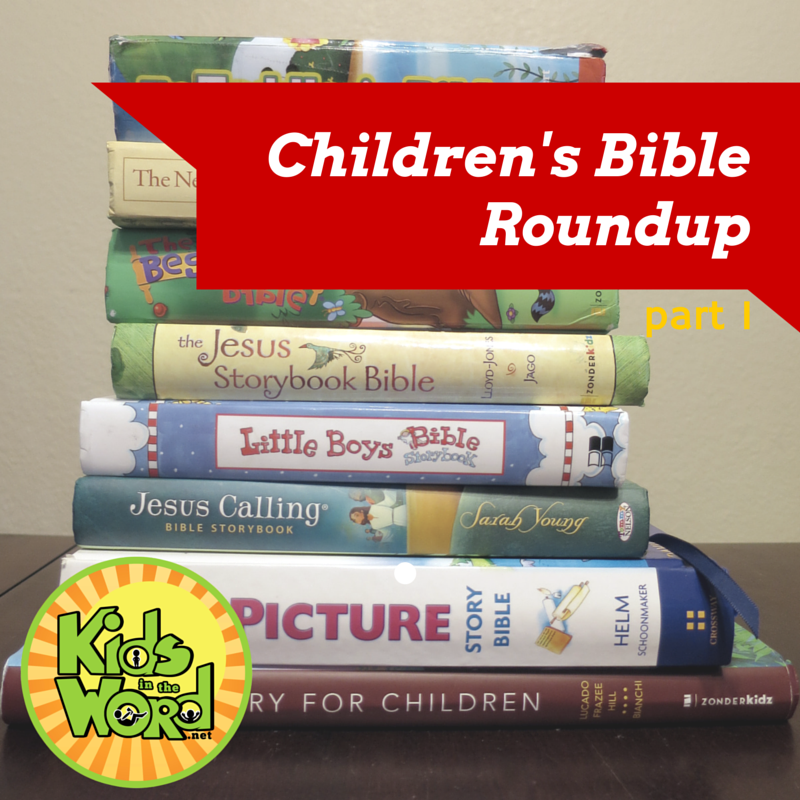 In hopes of narrowing it down a bit for you, I've compiled a list of popular Children's Bible Storybooks and offered a brief review of each. Due to the length, I've split this into two posts, so keep watching for part 2. This was the first Bible I chose for my son after he graduated out of the “Baby Storybook Bible” years. This is my favorite Bible for the early toddler years. The illustrations are colorful and charming. 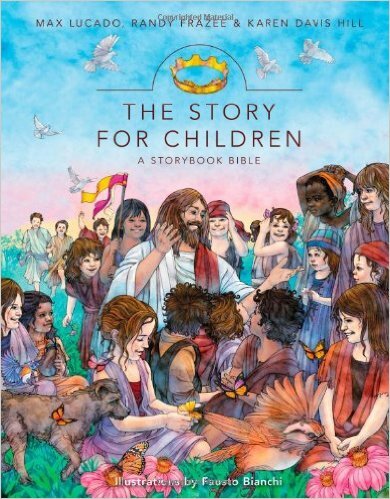 The selection of stories is a good cross-section of the Bible and includes the New Testament, which I found was somewhat out of the ordinary in Bibles for children this age. It doesn't omit the “dark” or “scary” parts of the Bible, but it addresses them in an age-appropriate manner. It is a storybook that has taken original text and summarized it for retelling, but the amount of extra-biblical embellishment and supposition is less than many of its counterparts. The stories are short, which is great for little ones with short attention spans. It does not quote actual scripture, so we only used this version for about two years before moving to something a little more comprehensive. 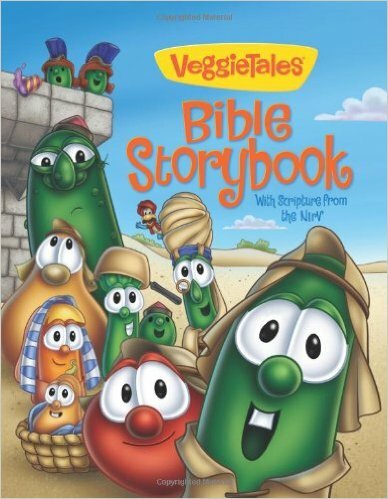 The Veggie Tales Bible Storybook pairs the stories inside with its popular films so if your child loves Veggie Tales, they will be excited to see what they've seen on screen reflected in their book pages. Each story begins with Bob and Larry introducing the scene and telling the Veggie Story, followed by a retelling of the actual Bible story, and then completed with a Bob and Larry recap. I did like that they included portions of actual scripture, but the actual Bible stories were the weakest part of the content. The Veggie stories often did a better job explaining the story than their scripture retelling did. Because each story is 3-part, there are only 21 stories included, also making this one of the less comprehensive options available. We removed this from our library because it was too much story, too little Bible, and I didn't think it added anything to what we already had in other books. 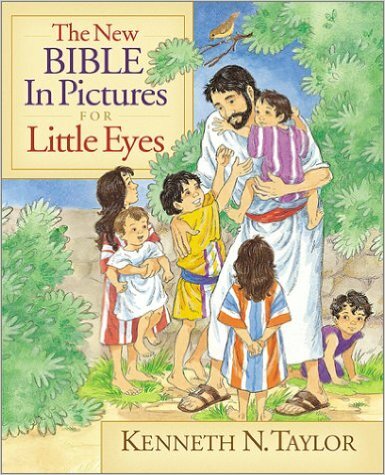 The New Bible in Pictures for Little Eyes has been a library staple for decades, even being awarded the Gold Medallion Book Award. The format is simple: a short retelling of the story, a few questions to ask your child, a short prayer, and a picture to correspond. Its strength is that it includes a lot of stories. Of all the storybook Bibles, this one has the broadest selection. In addition to the stories found in most Children's Bibles, (Creation, Noah, Moses, Jonah, etc. ), it also includes the stories of Hezekiah, Gideon, and Stephen. Where I find this Bible hard to use is the mismatch of subject matter with target age. For example, it includes several stories where someone kills or is killed. A very young child does not even really know what death or killing is, but for the older child who can understand a little better, the narrative is too simplistic to hold interest. The questions and prayers are very basic. The illustrations are not particularly engaging and everyone is very Caucasian. We hang on to this one for when we want to work in an area not included in other versions, but when there are other options, we choose one of them instead. If you're like me, you see the title of this and ask yourself, “Boy's Bible? 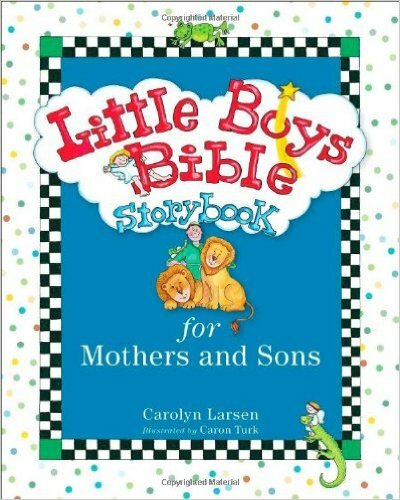 What could possibly be in the Bible that is for boys and not for girls?” There are corresponding versions for Fathers and Sons, Mothers and Daughters, and Fathers and Daughters. The format of this book is a loose retelling of a story, a brief devotional called “Becoming a Man of God,” suggestions for an activity to do or discussion to have together, and a Bible verse. The retellings in this book are dangerously inaccurate and the author takes huge liberties. For example, in the story of creation, it says that God suggested to Adam that he name the animals as a cure for boredom. God suggests that maybe an animal will be Adam's friend. Then in an epiphany, God says, “Oh I know! You're lonely! I'll make you a friend,” implying that the creation of Eve was not part of God's plan all along, or that some part of Adam and his emotions was previously unknown to God. Parts of the language are sarcastic, the book is rife with embellishment and speculation, and other portions are completely made up. The devotionals are better and can inspire good conversation, but they're not reason enough to own this book. They're also not gender specific, leading me to believe that this book was spun into multiple versions just to increase profitability. Skip this one and its counterparts. The poor handling of Scripture and egregious inaccuracies render it not worth the risk of confusing or misinforming your child. I purchased this at our second hand store entirely for the illustrations. This book is a true work of art. The illustrations are just beautiful and they are this book's strongest feature. The retellings are simplistic and slightly embellished, but are not problematic. This book is a companion to the adult version, The Story, which presents the Bible in novel format. I don't personally care for the current trend of first person narratives in God's voice, but nothing that I've read in this book is inconsistent with God's character and many of the things written are directly from scripture. This book also excels in being well-suited for both reading aloud by a parent, and self-reading by a beginning reader, which means it possesses one of the larger age ranges of the books on this list. In the next installment, I'll review Jesus Calling Bible Storybook, the Jesus Storybook Bible, the Beginner's Bible, and the Big Picture Story Bible. Have I left your favorite Bible for preschoolers off the list? Share your thoughts in the comments! 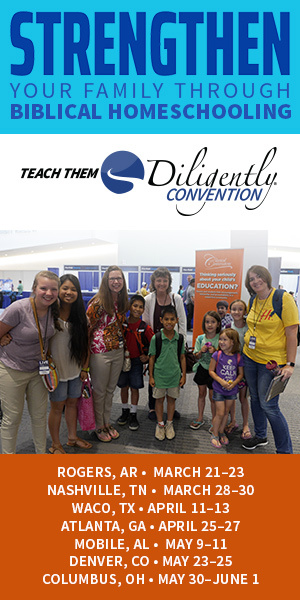 Storybook Bibles and Children's paraphrases are a useful tool for helping our children develop a biblical literacy, but we must remember that the Word of God is living and active and it can speak to our children, even if we think they cannot understand it. These tools are most effective when they are offered as a complement to the original, not a replacement of it. Love these reviews! Have you ever used Ergermier’s (sp) Children’s Story Bible? I actually just learned of this one a couple of weeks ago and have had it on my Amazon Wish List ever since! If I get a chance to check it out, I’ll update my post! Thanks for asking! My favorite for toddlers/preschoolers is The Rhyme Bible Storybook (and the simpler counterpart The Rhyme Bible Storybook for Toddlers). I love it. It held my sons attention from the time he was very little – something about the cadence of the rhyming. I hardly ever see this one on lists like these so I always have to share! I will check that one out! Thanks for sharing! I need part 2! Thanks for the reviews! 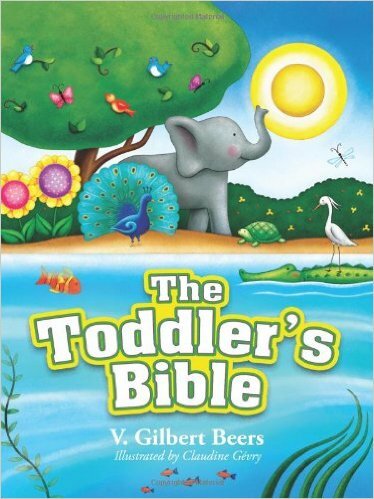 I was going to mention The Rhyme Bible as one our little ones and I have really enjoyed too. Thank you! 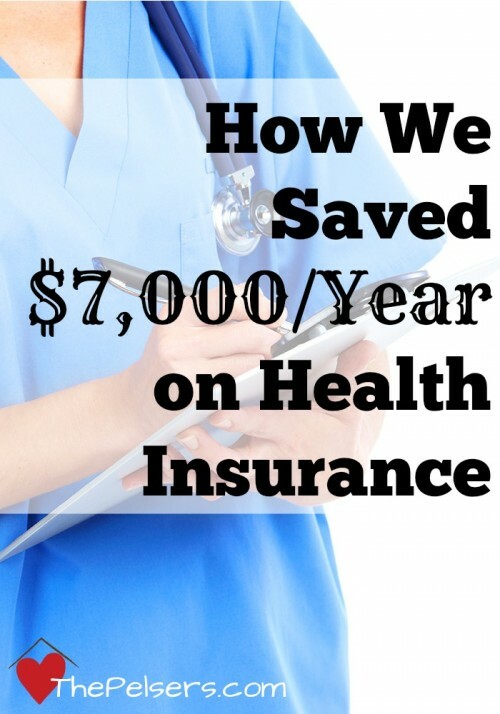 This post is very helpful. I’m in the market for an easy reader Bible once again. My 2nd grader literally wore hers out, and I’d like to purchase a fresh one for my kindergartner. My older children all started with an easy reader and we’d “buddy read” together. They’d read a page; I’d read a page; lather, rinse, repeat. Then they moved up to The Child’s Story Bible by Catherine Vos. After that an Egermeier’s Bible Story Book, which includes more of the less popular stories not often found in children’s books (Ehud/Eglon for example). Both of those are well written children’s books in their own right. By the time they made it through both of those they were more than ready to read from an ESV daily. I’ll be watching for part 2! Thanks, I teach Sunday School and have a 4 yr. boy and have been wanting to get him a bible but there are several out there to choose from. So again this is helpful….